In 2018, we conducted weekly nymph counts at three vineyard locations in Mendocino County from May 24- September 6. The first emergence of VCLH nymphs occurred during the week of May 14th (Table 1, Figure 1) and densities peaked on June 8, July 6, August 12 and September 4. We didn't observe WGLH nymphs until June 1, about 2 weeks after VCLH nymphs. WGLH nymph densities peaked on June 7, July 5, August 9 and August 30. In response to growing leafhopper populations, cooperating vineyards sprayed for leafhoppers at various times of the year (see black arrows in Fig. 1). 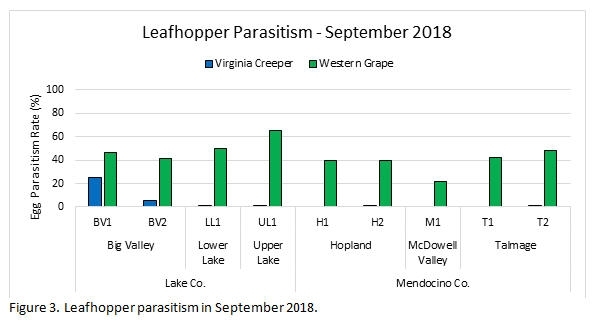 Leafhopper parasitism surveys were conducted in July and September across 9 vineyard locations from Lake and Mendocino Counties. This includes some sites where, in 2015-2017, we released Anagrus daanei, the key parasitoid of VCLH. 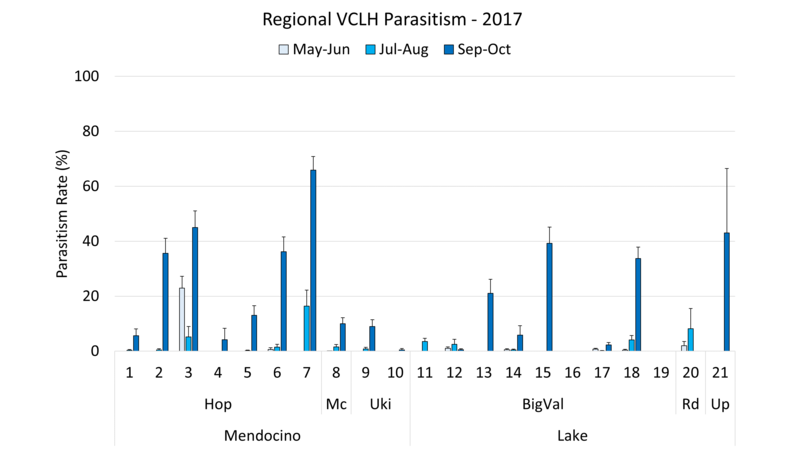 Parasitism data from both periods in 2018 were relatively similar, with relatively low rates of VCLH parasitism and high rates of WGLH parasitism (Table 2, Figure 2). This follows trends observed earlier in the season (Figure 3), and in previous years of study (2014-2017). VCLH parasitism does tend to increase towards the end of the season, but still remain <5% at most sites, although it is notable that the two sites with parasitism rates >5% were both vineyards where we released Anagrus daanei in previous years. Anagrus daanei is present in the North Coast, but this regional population does not attack VCLH. In 2014, an alternate population that readily attacks VCLH was identified in the Sacramento Valley. Between 2015-2017 more than 30,000 of these Sacramento Valley Anagrus daanei were released into Mendocino and Lake County vineyards, yet it remains unclear whether or not these parasitoids established in the region. While parasitism of VCLH certainly occurs now in the North Coast, higher rates of attack are needed to adequately control VCLH. Genetic evaluations of Anagrus daanei reared from North Coast leafhoppers are currently underway in an attempt to better understand whether or not parasitized VCLH are being attacked by the local or introduced population of Anagrus daanei. Table 2. 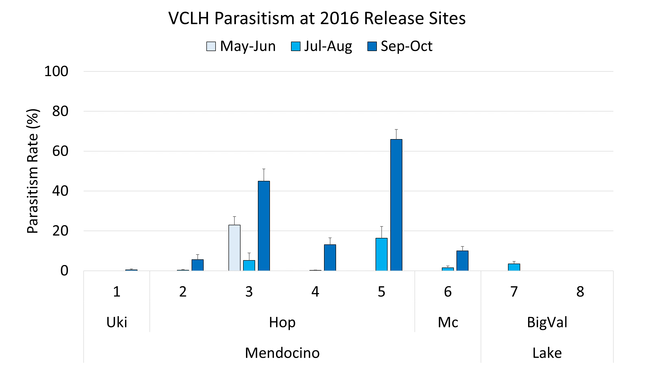 Average parasitism rate of VCLH and WGLH during the two sample periods. It is important to note the difference between the emergence time of VCLH and WGLH. Since VCLH emerge about 2 weeks earlier than WGLH, timing of sprays for VCLH will be earlier than what is typically expected for WGLH. Due to the lack of VCLH biological control, effective early-season control of VCLH is critical. Based on monitoring, if control measures are needed, the optimum application period would be when the majority of the first-generation population is still in the earlier nymphal stages (1st-3rd instars, approximately May/June). Depending on population levels at your site, follow-up applications may be required depending on previous treatments and leafhopper population thresholds, so it is important to continue to monitor for nymphs throughout the season. Finally, it is also important to notice how late season WGLH densities are generally lower than VCLH, even after multiple sprays. This is likely due to increased biological control of WGLH later in the season (see Figs. 2-3). 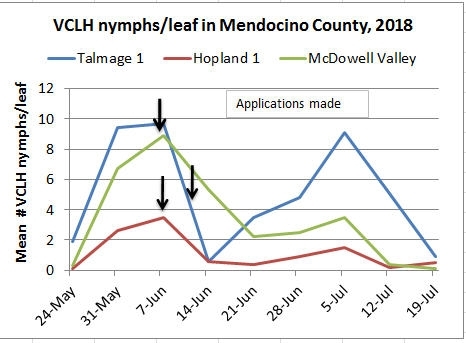 Monitoring efforts during the week of May 14th showed the first emergence of VCLH nymphs for the season (see Table 1/Figure 1 for # VCLH nymphs per leaf). The numbers of nymphs decreased on the week of June 11th as the three vineyards we are monitoring were sprayed for the first generation brood around that time. On August 9th we observed primarily small nymphs, 1st-3rd instars, but some nymphs ranged up to the final (5th) instar. If a treatment is warranted, target small nymphs. The nymph population will continue to increase due to VCLH generation overlap. We observed presence of viable VCLH eggs and nymphs across all sites being monitored. The leafhopper adults will begin moving higher up into the canopy to oviposit their eggs and thus we will be monitoring nodes 4-8. Due to the lack of biological control, effective early-season control of VCLH is critical. Based on monitoring, if control measures are needed, the optimum application period would be when the majority of the population is still in the younger nymphal stages. Depending on population levels at your site, follow-up applications may be required depending on previous treatments and leafhopper population thresholds, so it is important to continue to monitor for nymphs. Now would be a good time to consult your PCAs for materials, rates and timing advice for follow-up applications for leafhoppers. Table 1. 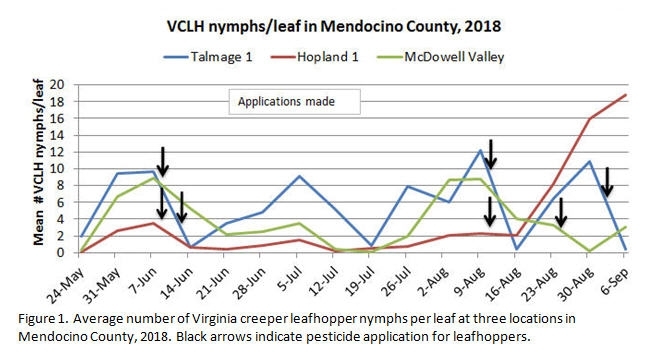 Average number of Virginia creeper leafhopper nymphs per leaf at three locations in Mendocino County, 2018. Figure 1. 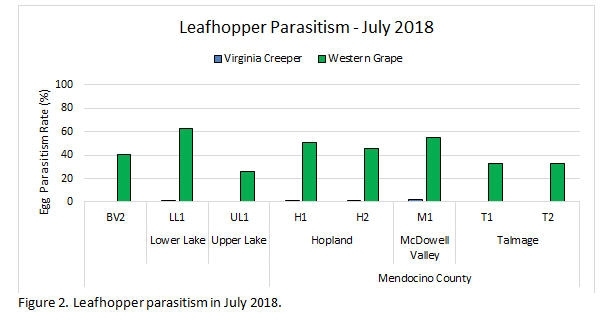 Average number of Virginia creeper leafhopper nymphs per leaf at three locations in Mendocino County, 2018. 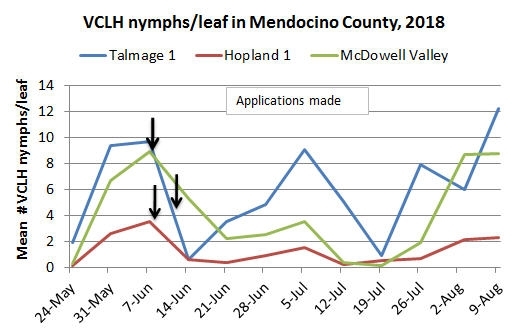 Monitoring efforts during the week of May 14th showed the first emergence of VCLH nymphs for the season (see Table 1/Figure 1 for # VCLH nymphs per leaf). The numbers of nymphs decreased on the week of June 11th as the three vineyards we are monitoring were sprayed for the first generation brood around that time. On August 3rd we observed primarily small nymphs, from 1st-3rd instars. If a treatment is warranted, target small nymphs. The nymph population will continue to increase due to VCLH generation overlap. We observed presence of viable VCLH eggs and nymphs across all sites being monitored. The leafhopper adults will begin moving higher up into the canopy to oviposit their eggs and thus we will be monitoring nodes 4-8. 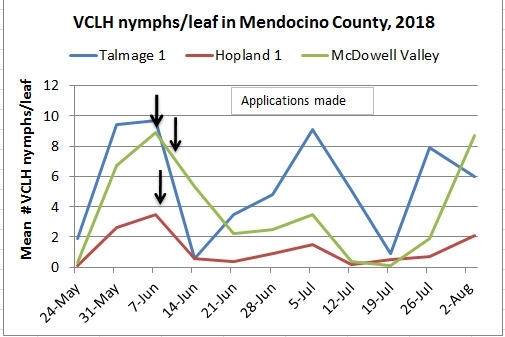 Monitoring efforts during the week of May 14th showed the first emergence of VCLH nymphs for the season (see Table 1/Figure 1 for # VCLH nymphs per leaf). The numbers of nymphs decreased on the week of June 11th as the three vineyards we are monitoring were sprayed around that time. On June 21st we observed cast skins for both VCLH and WGLH, signaling adult emergence and the start of the next generation egg laying. The nymph population is on the decline again due to second-generation nymphs molting into adults. Generations of VCLH are now overlapping; with viable VCLH eggs being observed across all sites in the field while conducting the nymph counts. The leafhopper adults will begin moving higher up into the canopy to oviposit their eggs and thus we will be monitoring nodes 4-6 now. Due to the lack of biological control, effective early-season control of VCLH is critical. Based on monitoring, if control measures are needed, the optimum application period would be when the majority of the population is still in the younger nymphal stages before the emergence of adults. Depending on population levels at your site, follow-up applications may be required depending on previous treatments and leafhopper population thresholds, so it is important to continue to monitor for nymphs. Consult your PCA for materials, rates and timing. On July 9 we surveyed parasitism of Western grape leafhopper (WGLH) and Virginia creeper leafhopper (VCLH) across 9 sites in Mendocino and Lake counties (Fig. 1). 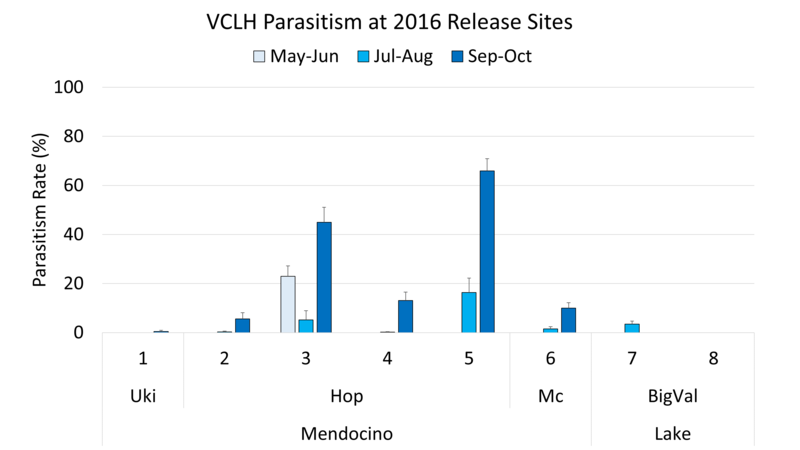 WGLH parasitism was fairly consistent (average 38%), but there was little to no VCLH parasitism (average 0.6%). These trends are in line with data from previous survey years (2014-2017). Figure 1. 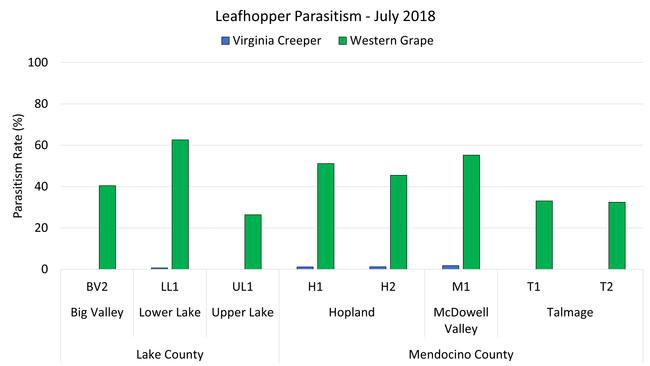 Leafhopper parasitism across Mendocino and Lake counties on July 9, 2018. Parasitism of WGLH was fairly consistent while there was little to no VCLH parasitism. Anagrus daanei is the key parasitoid of VCLH and is known to attack the eggs of both WGLH and VCLH. While this parasitoid species is present in the North Coast, they appear to only be attacking WGLH eggs. Even when isolated with VCLH eggs, the A. daanei from the North Coast will not attack it. Surveys across northern California in 2014 led to the identification of a population of A. daanei in the Sacramento Valley that do attack VCLH. Morphological and molecular comparisons of the A. daanei from the North Coast and Sacramento Valley indicate that these are not separate species, but rather just separate populations with different host preferences. From 2015-2017 a large-scale A. daanei rear-release program resulted in the introduction of more than 30,000 parasitoids across multiple regions of Mendocino and Lake counties. In some cases these introductions led to locally increased parasitism of VCLH, but results were inconsistent (Fig. 2). At present the rear-release program is inactive, but we are maintaining a colony of the Sacramento Valley A. daanei at UC Berkeley. 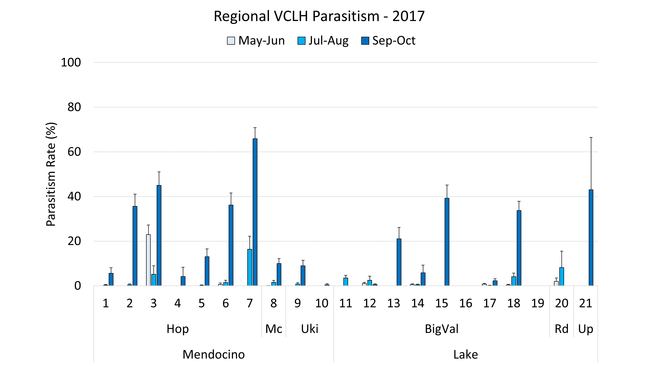 Annual trends indicate that VCLH parasitism is increasing across the region, albeit mostly at the end of the season (Fig. 3). What's interesting is that in some cases late season VCLH parasitism is occurring at sites where no parasitoids were introduced. We are currently conducting a more detailed genetic analysis of the A. daanei recovered from these late season VCLH in order to see if we can differentiate between the local and introduced parasitoids. In summary, parasitism of VCLH appears to be in flux and is certainly not consistent at this point. As such, growers need to remain vigilant. In the absence of adequate biological control, early and thorough monitoring of leafhoppers is essential. When populations surpass economic thresholds, well-timed sprays in the early season are critical to control VCLH populations, especially in organic and biodynamic vineyards. Many thanks to Ryan Keiffer (UCCE Mendocino) for carrying out this parasitism survey.